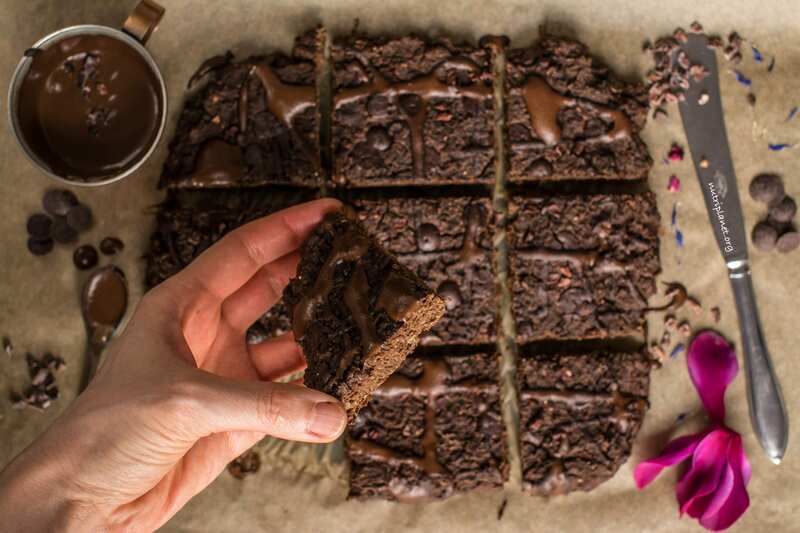 The tutorial video further down illustrates perfectly the simplicity of those vegan gluten free brownies! Now, my husband described those lentil brownies very well when he said they felt so rich when bitten into. And all that without any excessive fat! 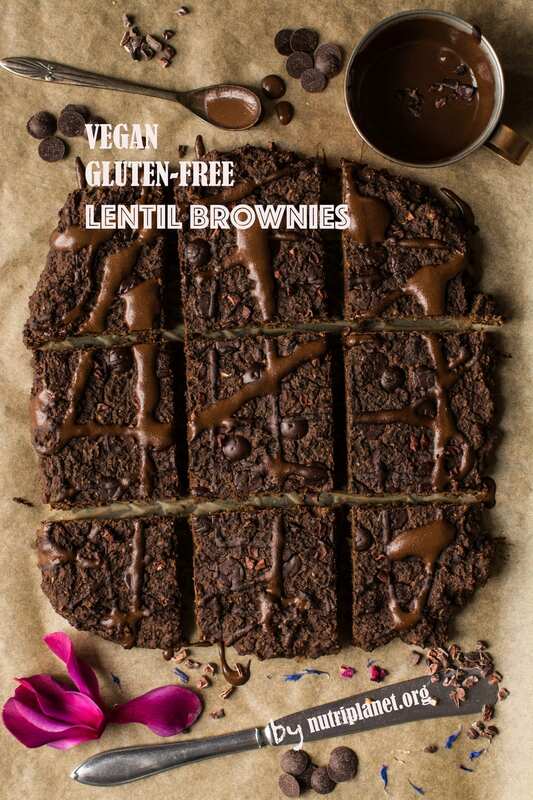 In fact, my vegan gluten free brownies are quite low in fat (27% of kcal) when compared to the conventional ones or even to most of the vegan versions that use vegan butter and/or oils. I myself discovered another awesome quality of those lentil brownies. Surprisingly enough, they remind me of the conventional baked ricotta (the Eastern European version) cake that I loved so much when I was a child. Aren’t lentils just amazing? I love that even after being plant-based for already 6 years I still discover new interesting combinations that blow my mind 🙂 That’s a great illustration of how exciting the plant world is! I came up with this vegan gluten free brownies recipe when I substituted chickpeas with lentils in my Chickpea Cookie Dough Bites recipe and added more carob and cocoa. Then, being too lazy to form cookies, I just spread the batter out on baking sheet and voilà – lentil brownies were born! While many vegan brownie recipes include flax eggs or chia seeds as binding agent, I find that no egg replacement is needed. On the contrary, all my vegan muffins, cakes, cookies and brownies bind excellently without any special ingredients. In fact, vegan baking is much easier than many might think! I dedicate a whole chapter on cooking/baking without dairy, eggs, oils and sugar in my book Plant-Based Made Easy: The Complete Practical Guide To Transitioning To Healthy Whole Food Diet. Read shorter version here: How to Eat and Cook Dairy Free and Egg Free. In addition, I don’t see the need to use baking powder in this lentil brownie recipe as it’s supposed to remain quite dense and moist. The only a bit unusual ingredient in my brownie recipe is mesquite flour, which I love for its sweetness and caramel taste. Check out the tips below for substitution options. 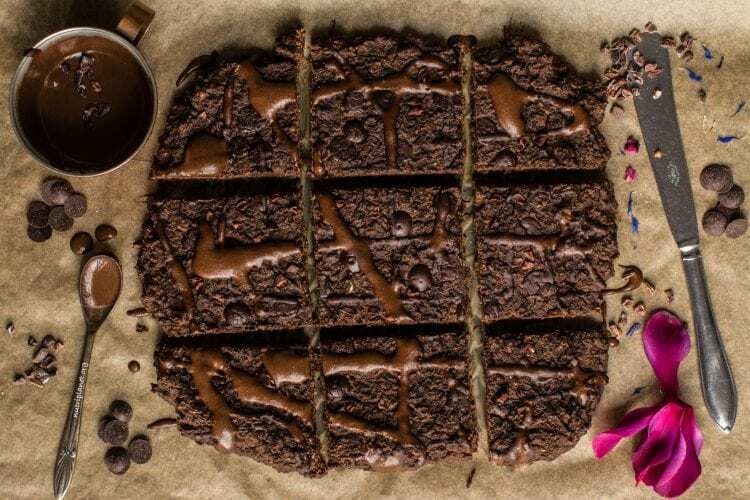 Finally, I’d love to hear from you if you try those brownies out – just leave me a comment below and tag me if you share your creation in social media! Finally, sprinkle on some chocolate chips and cocoa nibs, press them down and bake the brownies at 175°C (350°F) for 30 minutes. Let cool before slicing. Nutritional info (⅛ of the recipe): 126 kcal, 19.9g carbohydrates (63.4% of kcal), 3.81g fats (27.3% of kcal), 6.29g protein (20% of kcal), 5.41g fibre, and 7.6 GL points. 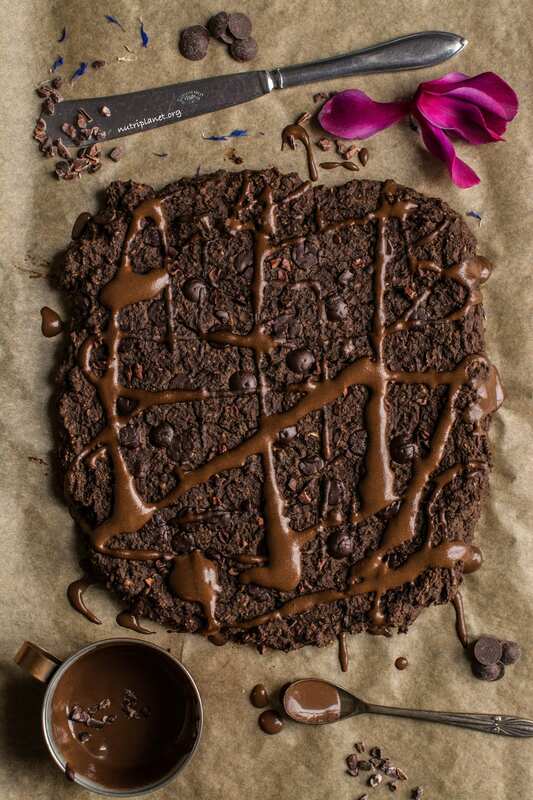 Should you be in the party mood, spread some Healthy Chocolate Sauce or Vegan Caramel Sauce onto cooled brownies, or have vegan ice cream aside. Could you use other lentils than Beluga? You could! However, if they turn out more of a mushy side (rather than grit), you’d need to add up to 50g (1.8oz) of LESS plant milk to the batter. Furthermore, also mung beans are wonderful in this recipe. Add the same weight (it’ll be a bit more than 2 cups of boiled mung beans). As with other types of lentils, add a bit less oat milk, i.e. 30-50g less. If you use pink/red lentils (hulled lentils), the GL points per serving would rise to 9.5 points. 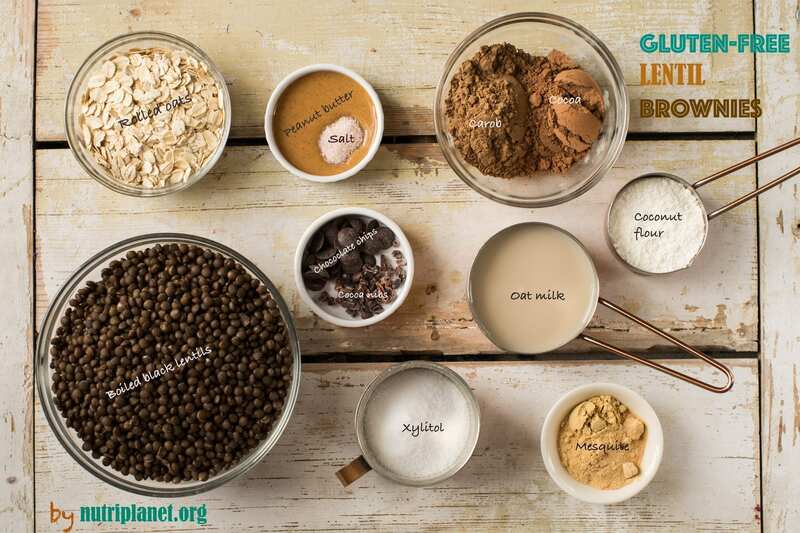 Any plant milk can be used instead of oat milk. Should you use unsweetened and naturally NOT sweet milk, you might need to add a bit more sweetener. You can substitute mesquite flour with lucuma or yacon. Should you not be able to get hold of any of those wonderful flours, add an additional tablespoon of coconut flour (or any other nut flour) to the batter. And, by all means, if you’re not on vegan Candida diet, any sweeteners are fine in this recipe, e.g. raw cane sugar, coconut nectar, coconut sugar (great to replace the caramel taste of mesquite), date paste, maple syrup, agave syrup. Finally, you’ll find storing tips at the end of my Sweet Potato Brownies recipe. You look so skinny. I am also skinny as well. I want to gain weight as I complaint from my family for too skinny and they are not allowed me to have a vegetarian. But I insist to this diet. Your diet seems not high calories. I have low energy and easily illness. Do you have any remedies? Thanks for your guidance ! Firstly, I’m naturally a skinny type, I’ve always been that way. I’m eating about 1900 kcal a day. 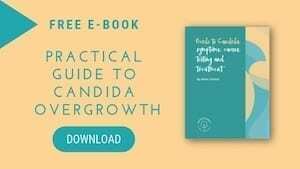 However, when I started the Candida cleanse I dropped to 1400-1500 kcal per day. I lost a few kilos, which was actually a good thing; and did have low energy for about a month (also due to detox), but then somehow my body adopted and I regained the energy. Even walking 10 000 steps a day and running errands I had enough energy consuming about 1500-1600 kcal. I am 172cm and weigh 53-54kg. Now, if you feel healthy and energised, it means that this is your healthy weight. You don’t need to listen to people who tell you that you look too skinny compared to the average because the average is fat 🙂 Did you know that the “normal” BMI’s and also children’s growth charts have been adjusted over the years just because the average is bigger now. And it’s bigger because all the fatty animal, dairy and refined products that people have been consuming. So, unfortunately it doesn’t mean that those average people are healthy. It’s a huge misguidance. In avoid to have good digestion, can I put berries to starch’s foods? As your foods combination’s article, you mentioned fruits never ate with starch’s foods. But your cake’s recipe has this stuff. Thanks for your guidance ! It’s very individual. It depends on what your digestion can handle. People with extremely sensitive digestion should follow the combining rules 100% all the time. I can have some berries with starches every now and then. I’ve also found that I tolerate goji berries in candy recipes. 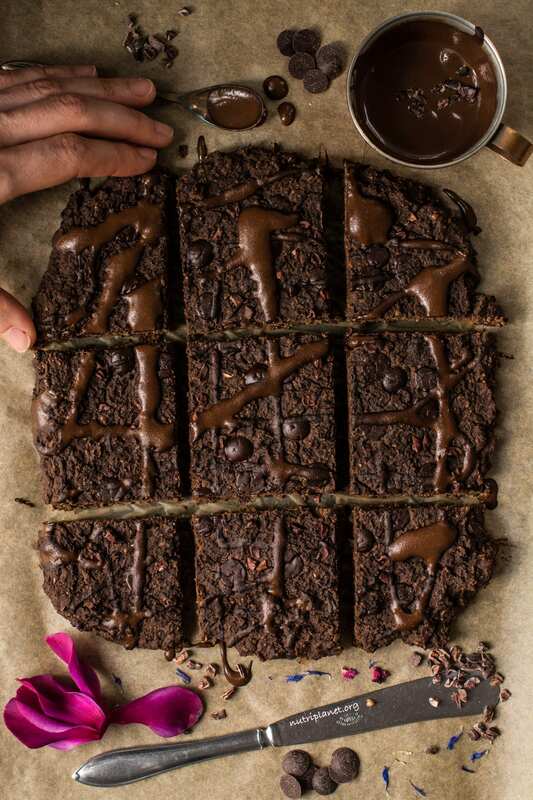 For example, this lentil brownie recipe doesn’t have any berries in it. In fact, none of the latest recipes have any fruits or berries, except for garnishing. To sum it up, you’d need to find out what are the optimal combinations for yourself. Thanks so much ! Can dried fruits put on the starch’s foods? I want to try your recipe but lots of stuff are out of our market. I ordered from iherb only but limited in foods’s range. Amz’s products can’t deliver to HK and with high shipping cost as well. So I will use the foods available that your recipes were mentioned. Your cakes and muffins are very nice with rainbow’s colour. It looks so pretty and attacks me to taste it. You are proud of cooking. Sorry that I sent the article before but forgot which articles showed on it. May be you already answered me. Are your book treated to ebook? Thanks ! Could you please refer to a specific recipe, so that I can suggest substitution for the items that are not available for you! As sugar is not fine for our body, I want to some products substitute the sugar. I have just using carob and dried fruits (I can tolerance of dried fruits) to replace all of sugar. I used stevia leaf to my drink as well. Your cake looks delicious and make frequently. How long are you consumed in 1 cake or 1 brownies? Will try your ebook later as I am quite busy on other studying? Will try your recipe but some little adjustment. This recipe contains xylitol, which is not the same as refined sugar. Xylitol is a naturally occurring alcohol found in most plant material, including many fruits and vegetables. It is extracted from birch wood and has much lower glycemic load than dried fruits for example. Of course, if you have no problem with dried fruits, you can use them as sweetener (which I also recommend under tips). We usually eat the whole brownie in one day 🙂 However, then I don’t have any legumes or grains with my lunch and dinner as the brownie itself provides enough protein. I hope you’ll like the book!